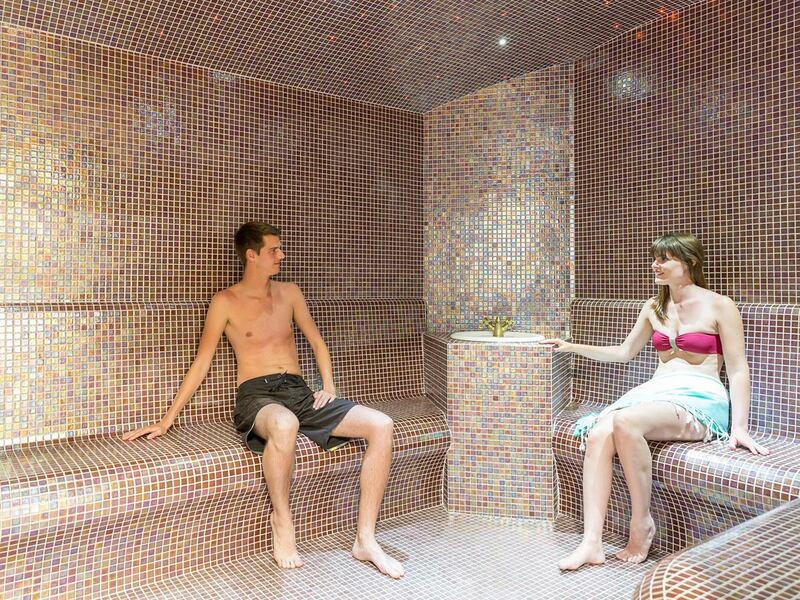 Enjoy the benefits of our wellness area with sauna, hammam and hydromassage cabin. The sauna offers a great number of properties: the warmth will help you relax and evacuate stress, while the dry heat purifies by opening the pores and eliminating toxins. The change from hot to cold offers complete wellness to the entire body. Contrary to the sauna, the hammam uses wet heat to calm body and mind. The heat is generally easier to support. Like at the sauna, the session should include a number of cold showers. You’ll be sure to relax and enjoy a moment of wellness. Wait no more and offer yourself a moment of relaxation. Please reserve at the reception. Tariff: 9 € per person, 16 € for 2 persons for a 1 hour session (not privatised, capacity of 10 persons per session). For security reasons the access to the wellness area is reserved to persons of +16 years.